Intensely flavorful and inherently healthy, Mediterranean food is one of the world's most appealing cuisines. Mediterranean cooks know how to make eating a pleasure. They do it simply—with olive oil and garlic; with herbs and spices; with tomatoes and eggplants, peppers and squash, figs and peaches, and other seasonal produce. And of course there is crusty bread and local cheese, the freshest yogurt and endless wine. In this authoritative and anecdotal cookbook, award-winning author Martha Rose Shulman captures the vibrant flavors of the Mediterranean region in more than 500 delicious vegetarian dishes that will appeal to everyone. The book represents years of meticulous research gleaned from Shulman's travels through France, Spain, Italy, the Balkans, Greece, Turkey, North Africa, and the Middle East. She presents authentic contemporary variations as well. You'll dine with her in Greek olive groves, feast on recipes handed down from mother to daughter for generations, and she offers her own tomatoes and fresh sardines in Croatia, savor coffee gelato in the streets of Bologna. At every turn in the road there is a new culinary reward. Whether you are a vegetarian or a dedicated meat eater, Shulman's recipes are substantial enough to satisfy any appetite. Included are such tempting creations as Majorcan Bread and Vegetable Soup, Provençal Chick Pea Salad, Pasta with Ligurian Artichoke Sauce, Greek Cauliflower Gratin with Feta and Olives, Balkan-Style Moussaka, North African Carrot "Compote," and Sweet Dessert Couscous with Citrus and Pomegranate. There is also an entire chapter devoted to the renowned "little foods" of the Mediterranean: tapas from Spain, antipasti and merende from Italy; meze from the eastern and southern Mediterranean, and more. In addition, the book features a glossary of useful cookware and indispensable pantry staples and the best online sources for hard-to-find ingredients. As Martha Rose Shulman herself says, "Mediterranean food enthralls me." 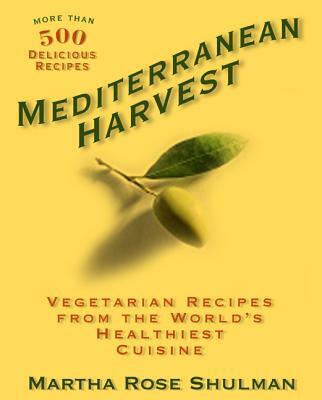 Readers of Mediterranean Harvest will be enthralled as well. MARTHA ROSE SHULMAN is the author of more than 25 books, including Mediterranean Light, the Julia Child Award-winning Provençal Light, and the IACP Award-winning Entertaining Light. Her articles have appeared in Bon Appetit, Food & Wine, Cooking Light, Saveur, the Los Angeles Times, Health Magazine, and other publications. She has taught cooking classes around the country and has been featured on radio and television, including Good Morning America and the Food Network. She lives in Los Angeles.